Kasese district is located along the Equator in the western region of Uganda. 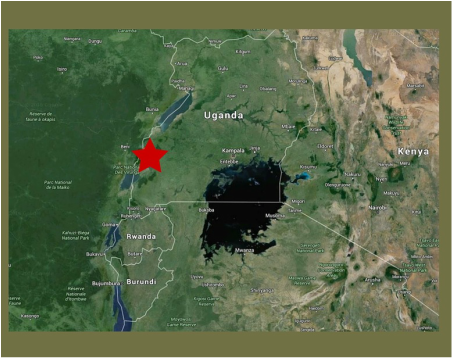 It borders the districts of Kabarole and Bundibugyo in the north, Lake George and Kamwenge in the east, Bushenyi and Lake Edward in the south and the Democratic Republic of Congo in the west. The district has an approximate total area of 31,205 sq km that is covered by wetlands, water and a savannah type of vegetation. There is mountainous terrain in the north with flat plains in the south. It receives an average rainfall ranging between 900-1600mm annually and two rain seasons that come between March to May and August to November. Temperatures normally range between 23.9ºc and 30.0ºc. The district has an approximate total population of 530,000 people. Kasese is a multi-ethnic district with many people of different ethnic backgrounds. The main languages and ethnic groups that dominate the area are the Lukonzo and Rutooro of the Bakonzo and Batooro people respectively. There are also other groups in the district who include the Banyankole, Basongora and Bakiga. Besides the languages unique to each ethnic group, usage of English, Swahili and Luganda is also widespread. Kasese district was formed in 1974 under the Provincial Administration of Rwenzori district that was curved out of Tooro. Prior to this, it was part of Toro kingdom that comprised the present districts of Bundibugyo, Kabarole, Kyenjojo, Kamwenge and Kasese. ​Like most districts in Uganda, Kasese district is predominantly agricultural, relying on farming for employment and income. The people keep livestock including cattle, goats, sheep and pigs.